Dalworth Flooring generously donated $1,000.00 to our school! The Celeste Junior High School gym floor was recently replaced after the unfortunate water leak this past summer that damaged the floor beyond repair. Workers from Dalworth Flooring began ripping the old water damaged floor out just as school was starting in August. The entire floor was a loss due to the devastating water damage. Then a team from ZFloor Sports Flooring of Dallas came in and installed the unfinished maple wood floor. Next came the sanding, staining and the creation of the custom Blue Devil floor logo. Incredibly, insurance covered the replacement cost, so Celeste ISD wasn’t out any money, and to top it off, Dalworth Flooring generously donated $1,000.00 to our school! The entire process of replacing the floor has taken many weeks. As the finishing touches are being made, students are growing eager to try out the new floor. Basketball season is just around the corner, so make plans to come out and view the beautiful new gymnasium floor and support our Celeste Junior High Blue Devils and Lady Blue Devils. 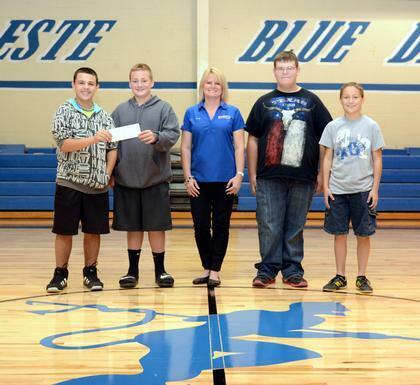 Dalworth Director of Marketing, Kady Beal, presented the Celeste Junior High Student Council officers (Christopher Jordan: President, Dylan Hicks: 7th Grade Officer, Kady Beal: Dalworth Director of Marketing, Larry Kysiak: Vice President, DeAnna Powell: 8th Grade Officer) with a check for $1000.00. Celeste ISD would like to recognize and thank Dalworth Flooring again for giving back to our school with their kind donation.